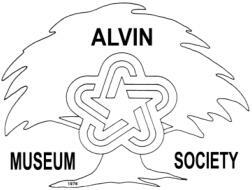 There was a good turn out at the dual meeting of the Alvin Museum Society on Sunday, August 28, 2005. We had the annual financial and activities report along with the first quarter report. Upcoming events include another "Another Evening with the Stars" planned for some time in early Spring; a sneak peak at the progress of the historical museum; and the April Garden Tour. Door prize winners were Jerry Pryor and Gay Prevost. The next quarterly meeting is November 20, 2005. Don't forget to keep track of your volunteer hours in support of the Alvin Museum Society's programs. Report your hours on a calendar year basis to Fran VanWinkle. It is important that all hours are reported because volunteer efforts are pertinent when applying for grants. So, if you haven't been recording your volunteer hours, take a few minutes now to review your participation and report to Fran by the end of the year. Many thanks for your cooperation in this task. The Alvin Senior Center is taking a trip to the Galveston County Historical Museum on Thursday, September 22, 2005, to view the "Glorious Voyage" exhibit. They will leave the Senior Center at 9:15 a.m. and eat lunch on the way home. Cost is $3.00 per person plus your meal. Payment deadline is September 15! Contact Alvin Senior Center for reservations.